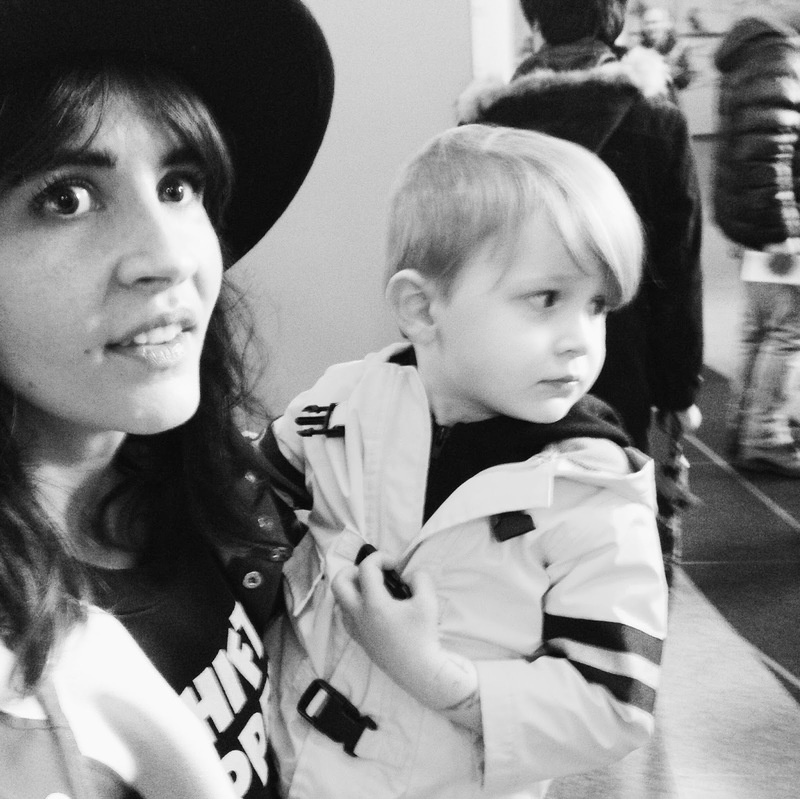 brandon took this of us at the american museum of natural history last weekend. it's a new favorite. i can't put my finger on it, but it does it for me. So hey, wow, this week, eh? We also did all the green things that you do, you know, green things and stuff: mirror selfies, super awesome outfits . . . we picked up the dry cleaning from the green cleaners place, it was a fun time. Aaaaand wink practice. Yes, at "Old McDonald's." Hey, it was a holiday! I came home to this little set up one afternoon this week when Brandon was working from home. How cute is THAT. Oh yes, and then there was all this . . .
sweet readers sending me hashtag hugs, my book on a SHELF, and cute, my husband paid full price for me! as someone pointed out when i instagrammed it--i suppose that does make me a ten cow wife! haha! So, wow, this week. On the one hand, this week was completely normal. Huck went to school, Brandon went to work. I wrote in cafés + tried to answer emails + met with future collaborators + did the laundry + then accidentally broke the screen on my laptop and decided to just live with it, you know, as you do, but then on the other hand! ON THE OTHER HAND. And I just wanted to gush and say THANK YOU! Thank you for writing such wonderfully kind reviews on your blogs + instagrams. Thank you for letting me know what resonated with you! (Like "Shirley's' Drapes." Oh gosh, I've been so excited for you all to read that one that I almost couldn't stand it, and it makes my heart so full to finally share it + get such sweet feedback.) And! The support on social media!! Thank you for hashtagging all your photos of the book so I could air-hug all of you from all the way over here. Sooo many air hugs! This has been a hugely wonderful experience, I can't even find the words. So thank you. I hadn't thought to expect any of this. Thank you and thank you and thank you. And to those of you who bought this ham sandwich and maybe wanted a Reuben, well. Next time I would love to write you a Reuben. But this one, it's ham. Yes I am comparing my book to a sandwich. You know. So this afternoon. This afternoon I came down with a raging case of the What's Nexts. You know those? Otherwise known as the Nowwwwww Whaaaaaats. The last time I had a case this strong was the day I walked out of the Testing Center at BYU after finishing my very last final. That feeling of WELL, CRAP. NOW WHAT. You know the one? I was asked this question in an interview the other day, this "What's next?" question. I hadn't yet caught the What's Next bug at the time and so the question sort of threw me. Like, What's next? Well, I have to pick up my kid from school in a couple hours . . . ??? But no, that's not what they meant, so I said, "book tour!" because, well, that is what is next. A book tour! How fun, right? I still shake my head at this, like, whaaaaaaaat. It's a two-parter. First comes Europe. I'll be in Paris April 4-8th, Amsterdam the 8-10th, Berlin the 10-12th where I'll be speaking at The Hive, and then London the 12-14th. Specific times + locations of signings + readings + possible meet ups are still being ironed out, so look for that once we have all our duckies in a row (and if you have recommendations, do you KNOW how much I want them? THIS much. Please! Send them over). There'll be a follow-up stateside tour landing something-June-y-ish that is still very early in the planning stages, so, you know. Posted / I'll keep ya. But yes, the What's Nexts. They're here, and pass the lozenges + the tissues, cause I got 'em pretty bad. Completing this book has felt like this great closure for this giant chapter in my life. The 2005-2015 years, they done feel archived. And it's like an entire section of my brain has just been vacated. I'm finding myself giddy with the options. What's next!? It's a hallway of options! Which doors should I open?! It's kind of exciting. I'm ready to dig in and see what I find. You know. Posted / I'll keep ya. YESSSSS to sheriff graham. yes yes yes yes yes. YES to the sheriff & hook. YUM! any chance your neighbours to the north will be getting a visit on your tour? :D :D my book was delivered while i was away for March break, can't wait to rip that package open when i get home! Your son is so cute! And congratulations on your book! It looks amazing! Congratulations on the book! And wow, you look amazing in that first picture! Woohoo, congrats on the publication of your book! I bet it's so exciting to see it on bookstore shelves! And loved your St. Patty's day pics :) Too cute. Yessss! So glad you'll be in the 'dam! Also... Huck's suspenders. Oh my goodness. natalie, the amnh photo is the one that he's going to show the love of his life one day, when they are looking through childhood things together. this is the one he's going to 'wow' at and pass to his love and say "isn't she a beauty?" You'll be in Paris! I work for a tour company here in the City of Light and we do lovely tours in English in all the big spots (you know, Notre Dame/St Chapelle, the Louvre, Musée D'Orsay, Versailles, and my specialty, the Eiffel Tower). Let me know if you have free time to come take a tour! Wow. That Apartment Therapy article touched a nerve with me! Zero interest in being a "happy" homemaker in a tip top clean house and being "productive" all the time. Here is to being unproductive and binge watching netflix! Here is to going for an adventure walk with my kids and ignoring dirty dishes. I just have zero interest in being a tired zombie person in the morning and not having my "stories" at night. It does not make me present. Giving zero f*** makes me present. I am a good mommy. A happy wife. And REALLY good at my job. I also have great taste. But being a type A clean/productive person? I am not that.